The premium droids are in combat mode and we are making ourselves comfortable to watch another pair fight it out for a place at the top. We've seen a few already, the newcomer LG G3 itself involved in a couple. The Xperia Z2 has a few under its belt as well, so these two should get straight at it, no time wasted on probing. 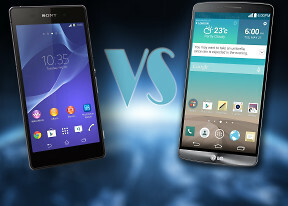 LG and Sony have been as good as subscribed to the Android top four but one thing they cannot afford is complacency. Thankfully, their latest flagships are showing none of it. What makes this shootout so special though is the months that stand between them. We're looking at this season's first and probably last Android flagship announced - phablets excluded. LG took their time to complete a massive upgrade over the G2, the undisputed highlight of which is the QHD screen. And they didn't stop there - the Koreans worked hard in the camera department to bring laser-autofocus and true-tone flash for great imaging experience. A removable battery and a microSD card slot are making a difference as well. Sony on the other hand didn't make such a splash - one of the potential pitfalls of a six-month release cycle. Admittedly, the Z2 had fewer things to worry about fixing. 4K video recording was added to the 20MP camera, the Omni Balance design with dual glass finish is intact, complete with water and dust resistance - a key selling feature of Sony flagships. The Xperia Z2 was pushed even closer to perfection with stereo speakers, 3GB of RAM and an even bigger battery. Bigger screen - 5.5" vs. 5.2"
So, is it the better specs or the right specs? The better looks or the comfortable handling? How do you choose between flagships that go out of their way to make sure you won't have to choose again for at least a couple of years? LG G3 brings features you don't see every day, like the QHD screen, OIS and laser-assisted autofocus. It has controls on the back and even an FM radio, which gets omitted more often than not lately. Sony Xperia Z2 on the other hand is betting on high megapixels and exceptional build, including protection against the elements. There's ANT+ support for pairing with fitness tracking devices, FM radio, and stereo speakers on board too. These are just pieces of the puzzle though, and what we'll try to do here is look at the whole picture. Buckle up, we hope you'll enjoy the ride. 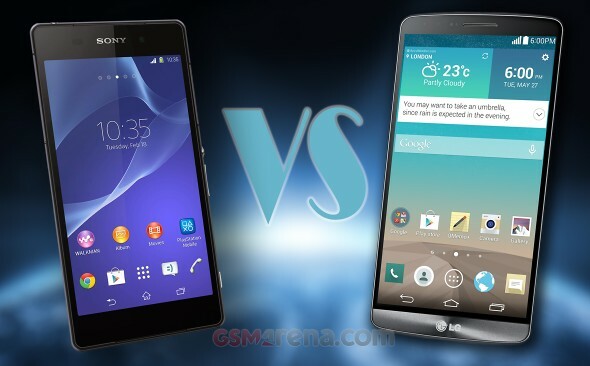 The winner is the LG G3. Clearly this is the right choice. Better than any other smartphone on the market. Kudos LG! G3 Excellent smart phone and i owned 1.,waterproof? yahh right i drop my phone at the swamp area and thinking that my g3 is dead..,when i get it back.,.omg!! still alive and kicking.,nice smart phone.,has secret features that z2 dont have.,.